Please only enable static network configuration if you don't have other means available for auto-configuration (e.g. DHCP). This could be the case, for example, in colocation environments. Manually specified DNS servers can become stale as networks change over time, which in many cases can render the probe dysfunctional. We therefore recommend not using static configuration unless you have no other option. As of probe firmware version 4030 we've enabled a feature that allows hosts to define static IP addresses and DNS resolvers for the probes. This allows you to install your probe in DHCP-less or IPv6-only networks. We recommend you read through this entire document before jumping into the procedure. You can assign static IPv4/IPv6 addresses and DNS resolvers to your probe using the web interface. This information is communicated to the probe using the existing control channels -- of course your probe has to be up and running (using DHCP) first in order for this to work. Once the probe receives this information, it'll try to use it immediately and upon each subsequent reboot. The probe considers the static configuration to be usable if it can reach the gateway defined in the configuration. If the probe considers the static network configuration to be wrong, then it tries to fall back to DHCP. If even that does not succeed, then it will not be able to connect, and it will keep on trying to configure its interfaces with the two methods. What follows is a detailed description on how you can enable static network configuration. You need to plug in your probe and make sure it comes online, at this stage using DHCP. Make sure your probe has already upgraded to version 4030 (or newer) -- see the probe status page to check this. If not, a power-cycle (just unplug the probe from the USB and plug it in again) will likely force the probe to upgrade, although this is not guaranteed, because the probes do not check for new firmwares upon each reboot. Login, and go to your probe's status page, switch to the "Network Information" tab, and click the Edit button you should see next to the address family you want to statically configure. Set the "Configuration:" field to "Static", and the form will change to allow for new values including Address, Gateway, etc. Make whatever changes are appropriate. Make sure the data is correct, including having DNS resolver entries matching the protocol version you've defined a static addresses for (ie. have an IPv4 DNS resolver entry if you configure static IPv4), and that these addresses are reachable from your network, otherwise the probe will not be able to resolve names. The probe should automatically go down and come back again in 5-20 minutes. It will try to use the given static configuration, but very likely fail (as it is still sitting in the network with DHCP) and fall back to DHCP. Once your probe is back online, you can verify that it recorded the static settings by reloading the page and looking at its Configuration pane. There should now be two sub-sections: "Current Configuration" and "Specified Configuration". If the latter has what you expect, and the last line says either "Confirmed" or "Applied", you're ready to move the probe to your its new statically configured home. At this point, you can unplug your probe and plug it to the statically configured network. It should connect to our infrastructure using the static configuration. Note: If your probe does not connect in the target network, then you need to should go back to the previous step: plug in with DHCP, and check your configuration. If all looks fine but it just doesn't work, let us know. If you want to change the static configuration again, we recommend to do it on a network with DHCP, in order to prevent any hiccups. As explained above, the probe tries to determine if its static network configuration works by trying to ping the gateway, and then checking whether it has a complete ARP entry for it. If not, it switches to DHCP. If that doesn't work either, then it goes in a loop of trying these two. In any case, the static address will remain configured on the probe, so you can't reuse the address for something else. As of now, we have no way of preventing the probe from accepting RAs. So if there is an IPv6 (rogue) RA on you network, it can/will override part of the static configuration. We're unsure if this will change in the future. If you apply a static configuration, you must supply DNS resolver(s) too. 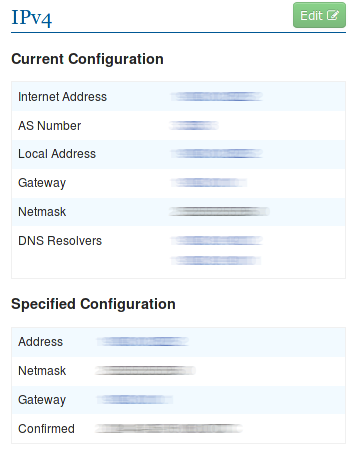 Obviously, the protocol version of these addresses should match the IP version you're configuring.